Below you will find a list of all the Paddy Power Casino bonuses - offered to new players. The right side offers a casino overview (click to scroll through the images). Paddy Power casino is a Playtech powered gambling destination that's available on all possible player platforms. Gamblers can choose from a free software download, instant Flash version, live dealer casino and mobile site optimised for iPad and iPhone only. Gaming highlights include a vast selection of red-hot progressive jackpot games, Marvel branded slots and a no strings attached no deposit bonus to explore the lot. The distinctly Irish gambling site offers voucher free promotions that simply require a buy-in in order to unlock gratuitous giveaways. Android users have not been forgotten as there's a variety of available Paddy Power apps that include bingo, Deal or No Deal and the live casino, with its real-time table games and ravishing croupiers! Although the well established UK online, live and mobile casino has designed its products and services for the domestic and European markets, international players are equally well catered for. 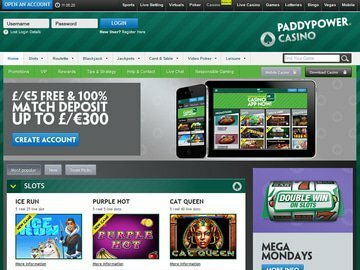 Canadians, from British Columbia, Alberta, Ontario and Newfoundland, are increasingly searching for Paddy Power no code no deposit bonus offers and opting to gamble in GBP. New players have a choice of two Paddy Power casino welcome giveaways. The first is a conventional percentage match valued at Â£200 and split over the first three buy-ins. The initial no code bonus buy-in triggers a 100% match up to Â£100, closely followed by a 50% match up to Â£50 on the next two stages. The second welcome option is a no deposit offer of Â£5 that can be used on any of the 200+ casino games. No code or voucher is required in order to claim. Players simply have to visit the promotions pages and buy-in to the offer of their choice and the funds will automatically be credited to their account. The primary welcome bonuses are valid at both the UK mobile and live dealer casinos. Explore the promotions page and you'll discover twin offers that don't require a promo code and are difficult to decline. Windfall Wednesday is free spins day. To qualify for free spins on sizzling video slots, you'll have to opt in and play a minimum of 50 games. On Thursdays, the UK casino will replenish your account if you lose while playing any of the eligible games. You'll get 100% cash back on losses up to Â£20! Playtech software is synonymous with Marvel branded slots, an extensive progressive jackpot network and seamless game play. The download casino offers more than 200 great games neatly arranged according to genre. The instant Flash version delivers browser-based action via 100 titles, the vast majority of which are multiline video slots. Opt for the voucher free no deposit bonus or free spins offer - where no promo code is required - and you'll be able to enjoy brand new slots releases such as Football Carnival, Sweet Party progressive and Ice Run. The instant play casino is compatible with Windows 98, 2000, ME and XP. Play, across all platforms, is available in English only. Paddy Power mobile casino supports iPad and iPhone users only. Apps, such as Deal or No Deal and the live dealer casino, are optimised for Android handsets and tablets. The portable client is packed with nine of the most popular casino games that include Frankie Dettori's Magic Seven, Marvel branded mobile slots such as The Fantastic Four, Iron Man 2 and Incredible Hulk and roulette and blackjack. Banking is supported on a secure platform and all sensitive data entered onsite is encrypted and stored on secure servers using a proprietary encryption algorithm. Reputable payment processors that include Visa, Mastercard, Visa Switch, Neteller, Skrill, uKash, Click2Pay and PayPal are used to facilitate secure deposits and withdrawals in British Pound and Euro. Gaming systems and payout rates are independently tested and certified by Technical Systems Testing (TST). Customer support services are available day and night via live help, email, telephone, post and fax. The casino urges players to contact a customer support advisor with any relevant enquiry, from how to download the software, register an account or buy-in to the latest voucher-less casino bonus. Together with great Playtech powered games, a no deposit bonus and twin promotions that deliver the goods each and every week, no promo code notwithstanding, Paddy Power casino offers unique player perks. A matching tool that enables the UK casino to recommend games according to your betting pattern is complemented by a personalised dash that allows you to keep track of play every minute of the day. Toss in a live dealer venue, a mobile casino for iPad and iPhone users and a suite of software apps for Android and it's little wonder Paddy Power is one of the most recognisable casino and sports betting brands on the planet! IGT has just released the new Pixies of the Forest II slot at Paddy Power Casino. This casino brand also offers a fantastic 100% match bonus up to $100 to newly registered customers from Canada. Promotional terms and conditions apply. The new Strolling Staxx slot from NetEnt has just arrived at the Paddy Power Casino brand. Register a new account and treat yourself to a fantastic 100% match bonus up to $100 before enjoying this fruit-themed slot for the month of January. Promotional Ts and Cs apply. 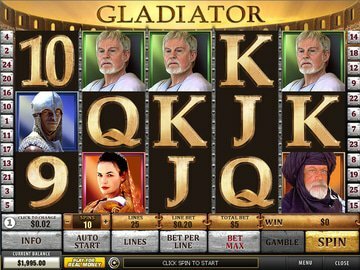 Paddy Power Casino has just received the latest slot games from Playtech. Canadian players will also be treated to a 100% match bonus up to $100 to spin the reels on some of the best slot in the industry. Promotional Ts and Cs apply. Aquaman is the latest slot from Playtech that will make its way to Paddy Power Casino in November. Canadian players can claim a 100% match bonus up to $100 to prolong their experience on this exciting new game. Ts and Cs apply. Travel to the future when you play the new Iron Girl slot from Playtech at Paddy Power Casino. With 100% match up to $100 for newly registered players from Canada, you can also enjoy other amazing slots from IGT and Red Tiger Gaming among others. Paddy Power Casino boasts with an exceptional range of casino games from Playtech, IGT, Evolution Gaming, Red Tiger Gaming, and more. Players can grab their 100% welcome bonus up to $100 and enjoy the latest slot releases every month. The new Raiders of the Hidden Realm slot has arrived at PaddyPower Casino. Be the first to play it with a 100% bonus up to $100 when you register an account. You'll also be able to play another new game: Legend of Jaguar slot. Wager a minimum of $50 on any of the slot games offered at Paddy Power Casino and receive a free $5 bet the following Monday. The $5 free bet can be used on any selected game and will last until the following Sunday. Terms and conditions apply. Take advantage of a super-powered experience at Paddy Power Casino. The new Superman Roulette tables feature progressive jackpots, unique side bets, and jaw-dropping win multipliers. Developed by Playtech, the new Superman Roulette tables are available on both desktop and mobile devices to win up to 726x your initial bet. Paddy Power is a great online casino site if you are looking for online gambling flash games! Their games load very fast and are very fun to play with! This site is definitely worth a check! New to the gaming world? Try PaddyPower Casino and get a chance to win as much as 25k every week when signing up for an account. Get access to hundreds of games from top software providers and huge bonus offerings. Get a chance to win 5 free spins with Santa Surprise this Holiday and use it to increase your chances of winning big prizes. Also get your hands on some of the most exciting casino games online from Paddy Power Casino. With a variety of games available online from slots to card and table games, every game is sure to be worth the time and effort. Make your Christmas much more merry with Paddy Power Casino and play your favorite games to get the chance to win as much as £/€3,000 each week! Just log in and play every week to win some of the hundreds of bonuses that will be given away. Visit their website to learn more information about these weekly draws. Money Mayhem: you could win a share of $3,000 every week. Simply wager $20 on any of the selected games to enter the weekly lucky draw.